When we moved in, eight years ago, the area behind the wall was all gravelled. 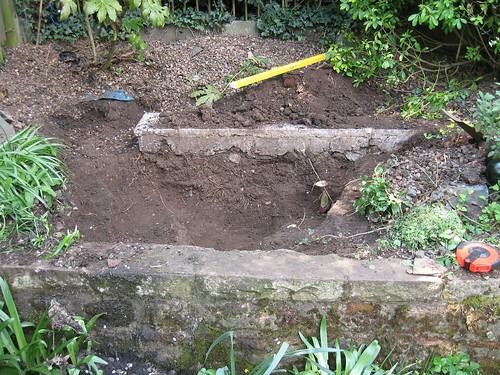 When I first decided to build a pond I was constrained by two shrubs at the front, and also by the surprise discovery of a very well engineered concrete path hidden half an inch down. The foundations of the path are half a metre deep. Rather than break it up with a sledgehammer, I decided to make a feature of it. However, with that and the shrubs, I ended up with a pond significantly smaller than I wanted. Subsequently, one shrub died because I'd got too close to it, and the other got far too big and had to be removed. Then this spring I found that the liner had sprung a leak. 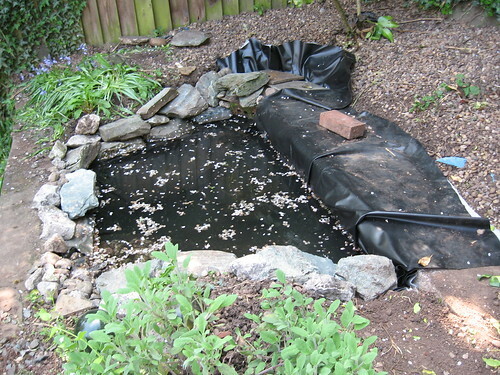 I was going to have to replace the liner, and I might as well extend the pond nearer to the size I had initially wanted. Here I have removed the old liner and underlay, and widened the hole on the right hand side. The wide shelf is for plants, and the narrow shelf above it is for the edging. Note the sloping section in the far left. This will be covered in cobbles to allow small animals access to and egress from the water. Do not do this if you want fish; fish and frogs do not coexist. There is a raised lip at the bottom of the slope to retain the cobbles. The edging shelf slopes away from the pond a little to help the edging stones to sit securely. The square thing in the foreground is the well-engineered concrete path. The only really important part of the design is to make sure that the edging shelf is at the same level all the way round. Water will not hide my sloppiness, and ugly black liner will be visible if I get this wrong. The planting shelves are between six inches and a foot below the level of the edging. 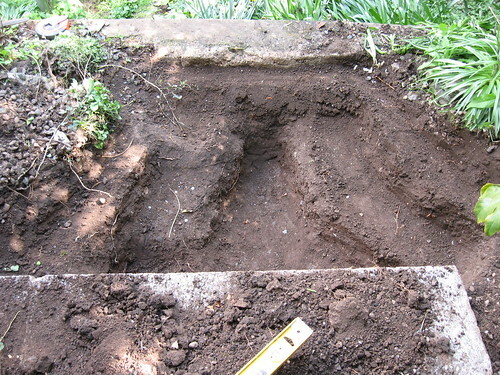 The maximum depth of the hole is eighteen inches from the edging, twenty-two inches from the top of the path. The green plastic box at the top of the photo is social housing for frogs. 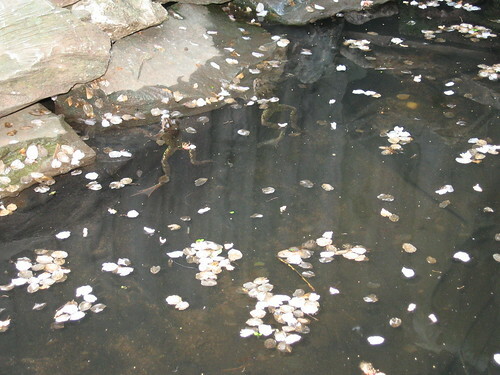 When I first found the pond almost empty I found about three dozen of them in the sludge at the bottom. I didn't find a hole so I filled the pond back up and returned all the frogs. Three weeks later the pond was empty again, and this time there were only about a dozen frogs there. Nobody likes living in the slums. The frogs even get free meals; I give them blood worms twice a week while I am working on the pond. The bucket is holding the only plant that has managed to survive. It's a false water lilly of some sort and it actually flowered last year. Real water lillys need water at least two feet deep, and rather more surface area than I have even after enlarging it. The raised area beside the path is for the waterfall feature. I paid vast amounts for a solar-powered pump, rather than have to run power the length of the garden. It was not an unalloyed success. On the positive side, it is free energy; I don't have to worry about switching it off to save money. But it was expensive in the first place, and then I had to pay a lot more for a bigger solar panel, because the first one I bought did nothing except in bright direct sunshine. There is not much bright direct sunshine in the UK. So for over £300 I got something that would work on most summer days and several spring and autumn days, but of course never on summer evenings to accompany a barbecue. I could fix that by buying a battery and a power controller, but I think I've probably spent enough. At that it might still be cheaper than paying an electrician to run an underground cable, but not by a vast amount. You see all that gravel in the waterfall area? It has all got to be picked out, including the gravel that falls in while I'm doing that. 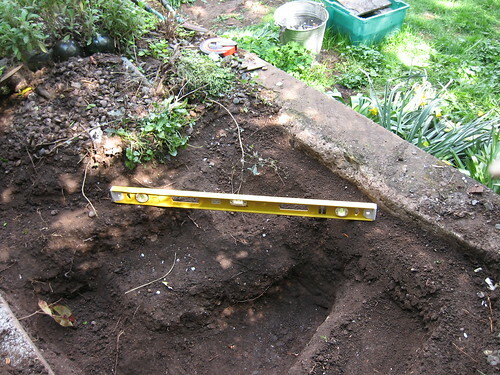 Any stones or protruding roots have to be removed because otherwise they might put a hole in the liner and I'd have to start all over again. The underlay goes in. 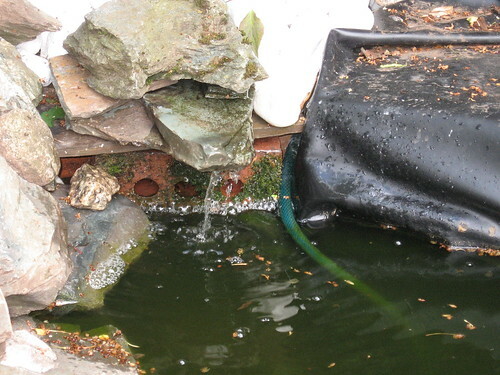 The rule is to take the horizontal size of the pond and then add twice the maximum depth to each number. In the case of this pond that makes 320cm x 360cm. 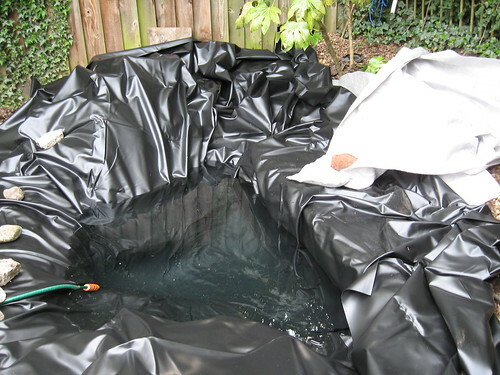 I then bought a 4m x 4.5m liner, because I'd far rather waste £15 than buy one that was too small and waste £50. The underlay is two pieces of 2m x 4m, and the two pieces overlap a lot. That is a good thing. Then go over the whole thing very carefully, and pick out every stone and lump of soil that has fallen onto it, and with all that gravel around, there are sure to be some. And now the liner itself. 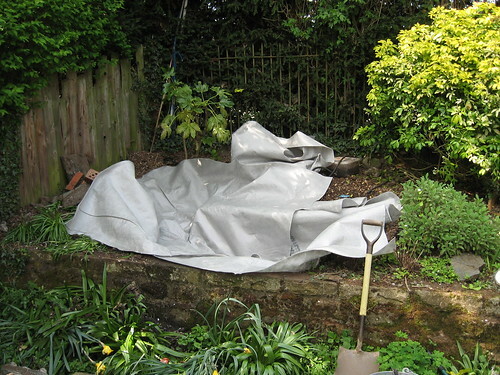 You unfold the liner over the pond rather than drag it, and be careful that none of that gravel falls under it, or the underlay wont make any difference. Theoretically you are supposed to put the liner flat over the pond, weight it down and let the weight of the water drag it down. That would probably leave me with fewer creases. It might be easy to do that with a feature pond in the middle of a lawn, but it is impossible here. So I pushed it into place and then filled it up. It seemed to work OK eight years ago. You do need to watch carefully and even out the creases as it fills. Now it is starting to come together. The edging stones are in (they are green slate rockery stones at about £3 each). Once that is done then the liner and underlay can be trimmed down so it is above the first course, but hidden by the second course. Then go round again and add a stone anywhere you can see black liner. I'm not too careful about making the stonework neat; the frogs love hiding between and behind the stones. Once more unto the beach dear friends. Here is the finished cobble beach. I put the big stones at the bottom and the small stones at the top; it looks odd if you don't. Each stone is carefully placed to hide the liner and there is only one layer. If you do it right it looks totally natural. It looks a bit weedy in this picture; it looks better in real life. The sun was about to go in as well. Before too long, that brick will be covered in moss. I had to buy a new pump. It looks like a fox or something chewed the wire of the old one about an inch from the pump. If it was in a dry bit I would have mended it, but I can't make a repair that is going to be under water for several years. 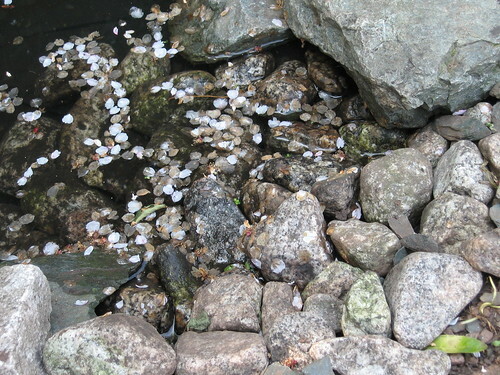 Then I got another bag of those cobbles and covered the back of the waterfall with them. I used the gravel last time, but it is a pain when you want to dig it back out. To cover the rather excessive black plastic I think I will edge it with more green slate. That panel is now about eight years old. Modern panels are about the same maximum output, but are a bit cheaper and may have better low-light behaviour. So I would not recommend anything smaller. This one is rated at 21 watts maximum output (1.27A at 16.5V). Hidden under the bushes is a small concrete slab resting on a square of bricks. That is sufficient to keep dry the plug and socket that connect the pump to the panel. The rule of thumb seems to be, count the number of frogs you can see and then multiply by five to ten (depending on how good you are at spotting them.) That's the number you actually have. The path. I've got to pop to B&Q and pick up some timber. I'm going to make a cover that looks like a wooden quay. That's what I did the first time. Unfortunately that one was rotten and could not be removed in one piece. The waterfall. Still some titivating to do.